TOPIC: An Update on The Canadian Exopolitics Initiative for public hearings on diplomatic relations with Ethical, advanced Extraterrestrial Civilizations. GUEST: ALFRED LAMBREMONT WEBRE, JD, MEd, International Director of the Instititute for Cooperation in Space and author of EXOPOLITICS: POLITICS, GOVERNMENT AND LAW IN THE UNIVERSE. Canada has assumed an international leadership role in the development of space age and energy technologies. The CF-105 Avro Arrow broke all international standards of aerodynamics with the sophisticated Orenda propulsion system that quite literally brought the Avro Arrow, a conventional aircraft, to the brink of space during test flights. The Avro Arrow was indeed the precursor to current shuttle design and technologies. Currently the Canada Arm’s proficiency has enabled shuttle missions to perform with incredible efficiency in earth orbit and builds upon a technology that may one day assist in the exploration of space. The time has again arrived for Canada to step forward to carry on its space and energy legacy. How will this be achieved? As you know, the former Minister of Defense of Canada under Nobel Laureate Prime Minister Lester B. Pearson, the Hon. Paul Hellyer, has recently made a public statement regarding Canadian National Security and Defense. This public policy statement has attracted documented, international unprecedented media attention. By last count, that statement has been covered in mainstream media in Canada (The Globe & Mail, The National Post, The Edmonton Sun), USA (MSNBC, FOX TV NEWS), Italy (LA STAMPA), and has been accessed by more than 577,000 registered journalists world-wide and 250,000 registered media outlets world-wide. "UFOs, are as real as the airplanes that fly over your head,"
Former Minister of Defense Hellyer went on to state: "The time has come to lift the veil of secrecy, and let the truth emerge, so there can be a real and informed debate, about one of the most important problems facing our planet today." Mr. Hellyer stated the Canadian people may be threatened with the consequences of war in outer space over our sovereign territory: "The United States military are preparing weapons which could be used against the aliens, and they could get us into an intergalactic war without us ever having any warning." He also expressed apprehension, saying: "I'm so concerned about what the consequences might be of starting an intergalactic war, that I just think I had to say something." Our 3 Non-Governmental Organizations have joined with former Minister of Defense Paul Hellyer in calling for public hearings in the Canadian Parliament on this issue, and Canadian public funding of a Decade of Contact: basic research and public education as well. A Decade of Contact - The Government of Canada will undertake a 10 year development of formal, funded process of public education, scientific research, educational curricula development and implementation, strategic planning, community activity, and public outreach concerning our terrestrial society’s full cultural, political, social, legal, and governmental communication and public interest diplomacy with advanced, ethical Off-Planet cultures now visiting Earth. The Canadian Exopolitical Initiative is able to provide Canadian government officials with scientific, military and space age experts who will provide data on entirely renewable, sustainable and environmentally friendly energy, technology and propulsion systems that will render current global reliance on fossil fuels and nuclear energy redundant. Expert witnesses will outline these matters in a clear and unequivocal manner. e) Early accounts of preparations for the weaponization of space. After viewing and considering the evidential material contained in the DVD package, it will become apparent that significant governmental measures will have to be taken to initiate investigation of this issue. It is therefore incumbent on the Parliament and Government of Canada to address these space age issues by holding Parliamentary hearings to review the incontrovertible and evidential nature of this material and enlist the capacity of the Canadian Exopolitical Initiative to provide the expert witness testimony indicated on the enclosed DVD resource material. We enclose for your review a DVD of the Briefing Document and Executive Summary with best cases, U.S. Government documents and direct U.S. government and military-intelligence witness testimony of representatives of intelligent, advanced Extraterrestrial civilizations interacting with humanity at this time. Party Policy - We request that the New Democratic Party adopt the Decade of Contact proposal as official policy for the Government of Canada. Election Briefing - If feasible, we are available to deliver a briefing on this issue for you and your staff during the current Federal Campaign. Post January 23, 2006 Federal Election - We request the opportunity for the Hon. Paul Hellyer, former Minister of Defense, together with the high-ranking U.S. and Canadian military-intelligence witnesses, experts in space age renewable and environmentally friendly energy systems to brief you and your officials on this issue so that the Government of Canada can begin to develop its public policy on this File in an orderly way. Canada has always taken a leadership role and is respected for its proactive position on matters of peace and international co-operation. Canada’s position on the issues outlined above will set an international standard and the development of a worldwide dialogue on the compelling policy implications that, before long will challenge all nations. Canada should initiate a Decade of Contact, of public education and research on the advanced, ethical Extraterrestrial Presence, and on new breakthroughs in energy and vital science and technology that will transform human civilization, eliminate the need for war and poverty, and usher in an era of unprecedented abundance for humanity. Analysis of the Briefing Document and Executive Summary will clearly set the stage for your investigation. We sincerely trust that these requests and support documents will receive careful attention and consideration by you and senior policy advisors. If there is any need for immediate clarification regarding the requests above or about the Briefing Document and Executive Summary, please do not hesitate to contact me. I will be contacting your office to follow up on these requests. OTTAWA - Liberal leadership front-runner Michael Ignatieff said Monday he is opposed to Canadian participation in the U.S. ballistic missile defence program. The leadership candidates were reacting to a call by Frank McKenna, former ambassador to the U.S. and one-time New Brunswick premier, for the Liberal party to reconsider its opposition to ballistic missile defence in the wake of North Korea's nuclear test. McKenna's recommendation was welcomed by Colin Kenny, Liberal chair of the Senate defence committee, which recently released a report urging the government to sign on to the missile defence program. McKenna said in a discussion paper Canada should not be a ''free rider'' on the United States. He recommended Liberals revisit the decision by former prime minister Paul Martin to renege on Canada's expected participation in the program in 2005. ''I do not support ballistic missile defence or the weaponization of space,'' Ignatieff, a freshman Toronto MP, said Monday in a statement to CanWest News Service. Dion welcomed Ignatieff's statement, saying he had understood since Ignatieff's speech to the 2005 Liberal biennial convention that he favoured Canadian participation. In that speech, Ignatieff noted that the Martin government's recently announced decision not to join the U.S. in developing the missile shield had proved popular within the party, but warned that ''We need to balance a principled opposition to the weaponization of space with an equally principled commitment to participate in North American defense now. Rae's comment that talks on the matter should not be a current government priority appeared to endorse the status quo. Conservative Prime Minister Stephen Harper, who has promised a free vote in the Commons should negotiations take place, said in the summer that he was not reopening the issue. Gerard Kennedy, fourth-ranking candidate in the leadership race, declined comment until he has had time to study McKenna's submission. EDS: ADDS quote from Alicia Johnston, a spokesperson forIgnatieff, on the 2005 speech. I was surprised and disappointed to learn about your recommendations for Canada to join missile defense. Indeed, the cost of getting involved, which is not financial, would be a great cost to hope for future generations, as you will see in this paradigm shifting letter. But the main purpose for this letter is to bring to your attention a related very important and SERIOUS WARNING by Dr. Steven Greer, the founder of the Disclosure Project (www.disclosureproject.org). Dr. Greer discloses the reality of UFOs and brings to our attention evidence proving that the reality of UFOs has been covered up. He has met with and discussed this serious issue with many high level military, intelligence and government officials, senior members of Congress, chairmen of committees, members of the Senate, members of royal families, including the wife of Boutrous Ghali, the former Secretary General of the United Nations, as well as President Clinton's former CIA Director (Dec. 13, 1993) James Woolsey. An investigation will discover that there are many reasons for this cover-up, including the desire by some for a gradual acclimatization to the idea of intelligent life in the Universe. The challenge is that there are reports of rogue elements within the political, corporate, military and intelligence agencies that a cover-up has been sustained for decades for more sinister reasons, such as reasons of control over oil and increased spending on weapons. Peace would be a very bad deal with many military industries, unless leaders of these industries find ways get non-military contracts. The cost of weapons is often looked at only from a tax-payer's perspective, but those on the receiving end are profiting enormously thanks to human conflicts and wars, such as the war in Iraq. As paradigm shifting as it is, Dr. Greer warns of a false flag operation (ABC News reports on false flags: http://www.prweb.com/releases/2006/09/prweb434292.htm) which would be related to a GLOBAL false UFO & alien threat to justify lucrative contracts for space weapons (billions and trillions of dollars by manipulating public trust). Once your committee investigates, you'll discover that false flag operations are designed to appear as if they are being carried out by other entities, such as other countries or terrorist groups, to help first demonize them and gain public support for wars in order to benefit with geopolitical control and financial gains. Because we will be faced with coming major global environmental problems, Mr. Alfred Webre's suggested exopolitical solutions below, endorsed by former Minister of National Defence Hon. Paul Hellyer, should not be ignored, but archived, researched and reflected upon by the Senate of Canada and our country's most brilliant scientists, for the sake of our children and grandchildren. This is a very global issue and we should ask ourselves what kind of a world do we want to leave behind for the children? A venomous one where abuse of power and abuse of others, torture, deception, false threats, and wars rule us, or one of freedom (of information), truth, honesty, compassion in action, and hope guide us? God / Source / Creator (or whatever word one uses based on one's cultural background) gave us free will, and we can choose to not misuse our free will. Through your publicly accountable role, I hope you remember that your influence can help create a brighter tomorrow for future generations of Canadians and citizens from around the world. It is no longer acceptable to claim ignorance when so much key information is available today from many good sources. This information can help create hindsight, and help us make better decisions today as our leaders gradually prepare Canadians for the good news about the most important revelation in the history of the world, a revelation that can be leveraged to help shift paradigms towards gradually discovering our Universal and Spiritual roots. Thank you for caring about the future, and for serving the public, the greater good. NOTE: This Open Letter was sent by a Canadian citizen to Senator Colin Kenny, Chair of The Standing Senate Committee on National Security and Defence, with copies to all members of the House of Commons of Canada. The Canadian Exopolitics Initiative for Public Hearings was filed with this Senate Committee. Exopolitics is the evolution of Alfred Lambremont Webre’s groundbreaking work as a futurist at the Stanford Research Institute, where in 1977 he directed a proposed extraterrestrial communication study project for the Carter White House. This project was initiated because Carter had seen a UFO in 1969 and was interested in the subject, as are millions of others today. It may turn the dominant view of our Universe upside down. It reveals that we live on an isolated planet in the midst of a populated, evolving, and highly organized inter-planetary, inter-galactic, and multi-dimensional Universe society. It explores why Earth seems to have been quarantined for eons from a more evolved Universe society. It suggests specific steps to end our isolation, by reaching out to the technologically and spiritually advanced civilizations that are engaging our world at this unique time in human history. A growing number of mainstream scientists are concluding that civilization – as we know it – may be extinct by the end of this century because of probable ecological catastrophes caused by climate change. To survive, we must transform the permanent warfare economy into a sustainable, cooperative Space Age society, release our addiction to fossil fuels, and move toward new, clean, renewable energy sources. An exopolitical approach to these challenges may well provide us with ecologically sound, life-saving solutions – a legacy of hope for our children and all future human generations. "Much of this book rings true. Certainly, our civilization cannot go on as we have. We will need all the help we can get to lift ourselves out of tyranny, genocide, and ecocide. So why not reach out toward those who are clearly more wise?" The Conservative government has no plans to join the U.S. ballistic missile defence system, despite a Senate defence committee recommendation to sign on. "We will not initiate discussions with the U.S. on this issue. The issue is closed," Etienne Allard, a spokesman for Defence Minister Gordon O'Connor, told Sun Media. "The U.S. ambassador has indicated that his government has no plans to ask Canada to join the program." Critics fear the defence program will escalate the international arms race, but the Senate committee believes advanced technology has the potential "to offer useful, non-nuclear defence to all of North America." Liberal Sen. Colin Kenny, chairman of the committee, said Canada is missing out on a "no-cost event." "We believe that Canada will have better-protected sovereignty by having a seat at the table," he said. "It's almost impolite to turn down an offer coming to us that really was a courtesy extended by the U.S., because there were no costs associated with it." NDP defence critic Dawn Black was shocked by the Senate suggestion to reopen the thorny debate. "We knew (the missile program) would escalate the arms race; it has escalated the arms race," she said. "It seems ridiculous to be suggesting that we revisit this again." SIGN OUR U.N. PETITION FOR A DECADE OF CONTACT - More than 4,000 Cultural Creatives worldwide have done so already! “OUR FUTURE SELF IN OUR FUTURE WORLD” with Alfred Lambremont Webre, J.D. M.Ed, author of Exopolitics: Politics, Government and Law in the Universe, Geri De Stefano-Webre, Ph.D. , and Dr. Janet Colli, author of Sacred Encounters: Spiritual Awakenings during Close Encounters. March 9-10, 2007 (Fri-Sat.) - PORT TOWNSEND, WA. PORT TOWNSEND SPECIAL March 2-3, 2007 Introductory screening of film STAR DREAMS, followed by a Panel discussion with filmmaker Robert Nicholl, Dr, Janet Colli and Geri DeStefano, PhD. • What am I up to? In "Future Self/Future World", we explore the notion that the possible answers to these questions have taken a quantum leap in the last decade. Are who we are a simple fact of biological determinism? Or do our ancestors come from distant worlds or other dimensions? • What are we REALLY up to in 2006 and 2007? In the year 2012 and beyond? Who are these “new humans”, Indigos? Starchildren? Are they really hardwired differently or do we just hope they are with the expectation that they will “save the planet”. What does the future hold for humanity? Will it be Armageddon, Global Warming & Earth Changes or a Transcendent Future? • Diplomacy with ethical advanced Off-planet Cultures now visiting Earth. • A HIGHER PLAN - Based upon “close encounter” experiences and scientific data, we conclude that — We are not alone in this task. A massive operation is underway involving integrated resources of diverse, advanced upper-dimensional Extraterrestrial civilizations, coordinated around an Integrated Plan to facilitate our living planet Earth's shift into a higher dimensional home within Extraterrestrial Civilization. "OUR FUTURE SELF IN OUR FUTURE WORLD" is designed to empower participants to harmonize with and thrive in the profound multi-dimensional shift toward a positive Exopolitical future occurring now in our personal and planetary reality. We will collectively and interactively explore questions and consider new strategies for us to take the quantum leap in a fuller consciousness. We have the capacity to create our future selves and world and it is time to examine the beliefs we hold that will shape that future. Alfred Lambremont Webre, JD, MEd is the author of Exopolitics: Politics, Government And Law in the Universe, and International Director of the Institute for Cooperation in Space (ICIS), dedicated to preventing the weaponization of space, transforming the permanent war economy into a peaceful, sustainable Space Age society, and supporting cooperation amongst Life in the Universe. Alfred's book EXOPOLITICS is the evolution of the groundbreaking work he did as a futurist at the Stanford Research Institute (SRI), where in 1977 he directed a proposed extraterrestrial communication study project for the Carter White House. Exopolitics reveals that we live on an isolated planet in the midst of a populated, evolving, and highly organized inter-planetary, inter-galactic, and multi-dimensional Universe society. It explores why Earth seems to have been quarantined for eons from a more evolved Universe society. Exopolitics suggests specific steps to end our isolation, by reaching out to the technologically and spiritually advanced civilizations that are engaging our world at this unique, challenging time in human history. Geri De Stefano, PhD has been a practicing psychic, teacher and business consultant for 30 years in the United States and Canada, working with businesses, professionals, authors, artists, actors and musicians. "Learning to use your psychic abilities can potentially give you an "edge", but you must be open and willing to use your ability in practical ways, as in business, in order for it to have any real value in your life." She has been working with and tracking Starchildren for the past 25 years. Janet Elizabeth Colli is a consciousness researcher who integrates psychology with spiritual emergence and healing. Dr. Colli holds a Ph.D. in Clinical Psychology and is among the most skilled clinicians in the Pacific Northwest helping those who are awakening to their relationship with the subtle realm. She researches the role of trauma in entering transpersonal realms, and utilizes Eye Movement Desensitization and Reprocessing (EMDR). Janet Colli's book, “SACRED ENCOUNTERS: Spiritual Awakenings During Close Encounters," is the culmination of 13 years of research bringing together the psychology of close encounters, spiritual experience, and — enlightenment. Already the current surge of “subtle realm” encounters has unveiled the hidden dimension that surrounds us — the realm of angels and aliens. Yet few Westerners realize that the same gurus enshrined in ancient lineages communicate with so-called aliens. SACRED ENCOUNTERS reveals startling evidence establishing this connection relating to Sufi, Hindu and Tibetan Buddhist traditions. Dr. Colli believes that those among us who sense the subtle realms herald a critical stage in human evolution. Subtle realm experiences are ushering in an era when close encounters, non-local communication and travel will be un-exceptional. Sacred Encounters prepares the modern world for our next evolutionary leap. SACRED ENCOUNTERS presents psychological research and case studies such as “Hayley,” who demonstrates the transition from posttraumatic stress disorder (PTSD) to Interspecies Communicator. Trace her developmental process as she learns to transform her terror into love. Discover the pivotal role so-called aliens are playing in the transformation of human consciousness — from those who are living it, firsthand. Vancouver, BC (PRWEB) July 26, 2005 -- If our current libel laws were to extend beyond Earth"s boundaries, Steven Spielberg"s War of the Worlds might be found to be defamatory towards a race of extraterrestrial beings that may be living below the surface of Mars. That is the claim of a veteran lawyer and space peace activist who says that by portraying Martians as aggressive attackers, Spielberg"s new film also misrepresents the broader challenge that humanity must confront interacting with other civilizations in space. A graduate of Yale Law School, Alfred Lambremont Webre is known as the founding father of exopolitics. His work as a futurist at the prestigious Stanford Research Institute (SRI) in 1977 directing a proposed Extraterrestrial Communication Project for the Carter White House led to the emergence of exopolitics as a social science discipline. Like many other futurists, Webre has concluded that humanity is destined to become a space-faring civilization. But he has been at the forefront of advocating that such a future will require a program of public interest diplomacy with "off-planet cultures." In his newly released book Exopolitics: Politics, Government, and Law in the Universe (Filament Books; $9.99), Webre presents a practical and philosophical model of how such an outreach program to other planetary civilizations might be shaped. Webre thinks that intergalactic diplomacy will involve peaceful co-existence and cooperation with other civilizations founded on principles of Universal law. "Exopolitics is premised on the notion that if humanity is not only to survive but thrive in the Universe, it will have to develop a political science to effectively interact with the beings that it will encounter in space," Webre says. It might seem like science fiction fantasy to some, but Webre"s book deals with a subject that is taken very seriously by some of the most accomplished members of Earth society. Among many other prominent citizens of this world, a former American astronaut and one of Canada"s former defense ministers have endorsed Exopolitics. "The scientific paradigm of the 20th Century was that intelligent life ended at Earth"s geo-stationary orbit," Webre explains. "The exopolitics model informs us that, in reality, Earth appears to be an isolated planet in the midst of a populated Universe composed of intelligent civilizations subject to Universal law, operating under Universal forms of governance, and mediated by Universe politics." Webre delights in the cosmic irony that his e-book publisher, Filament Books, originally decided to publish Exopolitics on its website along with War of the Worlds, H.G. Wells" classic account of an alien invasion from Mars that inspired Spielberg"s new blockbuster. In his science fiction novel, Wells portrays Mars – and by implication, other planets – as harbingers of alien monsters that wish to attack and destroy our planetary civilization. "[Across the gulf of space … intellects vast and cool and unsympathetic regarded this Earth with envious eyes, and slowly and surely drew their plans against us," Wells wrote. Webre has a far more optimistic view of Mars and other possibly populated planets. He thinks that human contact with aliens represents not a "final threat" but a "future hope." His optimism is fueled by recent scientific discoveries made by NASA"s Mars Rover. These findings confirm the high probability that the red planet could host life today. 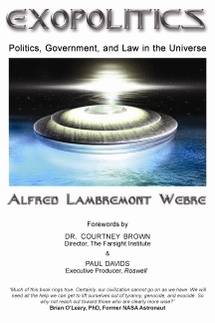 Webre is also intrigued by data derived from the scientific process of "remote viewing" which suggest that below Mars" surface dwells a peaceful race of intelligent humanoid beings that survived an environmental cataclysm on Mars that occurred eons ago. "Remote viewing" is the mental process of perceiving and describing places, persons, and events at distant locations. It was sponsored and developed by the Central Intelligence Agency (CIA) and the Defense Intelligence Agency (DIA) in the early 1970"s with the help of scientists from Stanford Research Institute. According to Webre, both remote viewers within the American intelligence community and civilian remote viewers trained by the US government have discovered astounding data about life on Mars, including the fact that the surviving Martian culture has technology that appears to be 150 years in advance of our present day civilization. The remote viewing data indicate that because their physical appearance is so similar to humans on Earth, some Martians have already migrated to villages in South America. "Humans from Mars seem to be genetically related to humans on Earth," Webre says. "This raises many important questions – for science as well as for religion." If such data prove accurate, Webre thinks that mutually beneficial agreements with our extended "human" family from Mars could help human civilization on Earth cope with the looming environmental challenges that threaten our own planetary survival. His brilliant treatise Exopolitics describes the steps that must be taken to move in that direction. It sets forth an agenda for a hopeful future in which humanity addresses the challenge of contact with other civilizations in the Universe not in a "war of the worlds" scenario but through a "peace among worlds" initiative. It is "a roadmap to the stars." Alfred Lambremont Webre is a futurist and lawyer educated at Yale Law School. He was a Fulbright scholar. A member of the bar of the District of Columbia, he once served as general counsel to New York City"s Environmental Protection Agency. He was a Clinton-Gore delegate to the 1996 Texas Democratic convention. He lives in Vancouver, BC, where he is the International Director of the Institute for Cooperation in Space (ICIS). WHAT OTHERS ARE SAYING ABOUT "EXOPOLITICS"
EDITOR'S NOTE: This article by Dr. Michael Salla, Director of the Exopolitics Institute, bridges easily into the "mainstream" conceptual paradigm. Alfred Lambremont Webre, JD, MEd. "Aloha all, here's the introduction to my latest research article in the Exopolitics Journal. As the article makes clear, there is compelling evidence that extraterrestrials have succesfully integrated themselves among the population and this is known to various government agencies who monitor the extraterrestrials and keep this from the general public. " There is startling evidence from a number of independent sources that ‘human looking’ extraterrestrial visitors have integrated with and lived in major population centers up until recently, and this is known by a select number of government agencies and military departments. A range of highly classified government documents and military programs give credence to this phenomenon, as revealed by a number of whistleblowers. Command Sergeant Major Robert Dean, for example, claims that a top secret NATO document he witnessed in 1964 described how senior political and military leaders had been visited by and interacted with ‘human looking’ extraterrestrials who could easily blend into human society. What really concerned NATO leaders, according to Dean, was that extraterrestrials could be walking in the corridors of key political and military institutions. Aside from whistleblower testimonies, a number of private individuals claim to have encountered extraterrestrials posing as ordinary citizens in major cities around the planet. George Adamski was the first to write about extraterrestrials secretly living among the human population. In his second non-fiction book describing his extraterrestrial contact experiences, Inside the Flying Saucers, Adamski discussed how human looking extraterrestrials had established a presence among the human population. They apparently looked so much like us that they could get jobs, lived in neighborhoods, drove cars, and could blend in easily with the human population. Adamski wrote about how they contacted him to set up meetings that led to his famous flights aboard extraterrestrial vehicles. While controversy over Adamski’s contact experiences and his credibility continues, Adamski’s UFO sightings and contacts with extraterrestrials were supported by an impressive collection of witnesses, photographs and films that a number of independent investigators concluded were not hoaxes. Adamski’s testimony offers important insights into how extraterrestrials may be living incognito among the human population. After discussing the Adamski case and the strongest evidence supporting it, I will then discuss other contactees similarly claiming to have encountered extraterrestrials acting like ordinary citizens. Finally, I examine a number of whistleblowers who claim to have witnessed documents or events confirming official government knowledge that extraterrestrials live among ordinary citizens.